Rotary Club of Gryffe Valley - welcome! Please scroll/swipe down through this page to find out more about us, in addition to the pages linked in the menu, top-left. 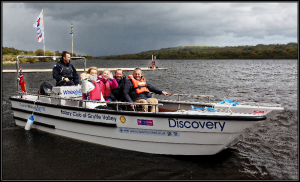 To support disabled sailing for wheelchair users at Castle Semple Loch Gryffe Valley Rotary purchased a special powered Wheelyboat to enabled those in wheelchairs to get out onto the water. 10K run in the country lanes between Houston, Kilmacolm and Bridge of Weir. RESULTS LINK FOLLOWS PHOTOS! Annual 10K run around the lanes between Houston and Bridge of Weir, supported by Arnold Clark, in aid of St Vincent's Hospice. 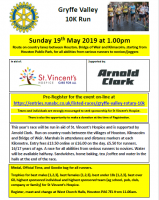 Register for the event on-line at https://entries.runabc.co.uk/listed-races/gryffe-valley-rotary-10k . The River Gryffe flows from the Gryffe reservoir and emerges near Kilmacolm. It then flows through Quarriers Village, Bridge of Weir, Crosslee and Houston before joining the Black Cart river near Glasgow airport. 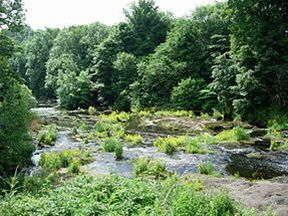 The surrounding area is known as the Gryffe Valley, and it provides the name and the catchment area for our Rotary club. Please look around the website to see more of what Rotary does and contact us if you have good ideas for projects. We are a friendly club with 40+ members with a diverse range of backgrounds and interests. Most hail from Houston, Bridge of Weir and Kilmacolm with others from Brookfield, Kilbarchan and Lochwinnoch. We enjoy our speaker meetings and great meals at the River Inn, Crosslee and through our joint efforts we like to give something back to the broader community through three branches of Rotary service - Community, Youth and International. By the end of this Rotary year in June we will have raised more than a quarter of a million pounds in supoort of charitable causes in these three areas! FUN - we like to have a good time! We aim to enjoy a decent meal and an array of informative and entertaining speakers at our weekly meetings, and we organise a series of social events (like a Burns Supper and our BBQ in the summer) when we invite our friends and families to join us in having a good time whilst of course helping us to raise money. FELLOWSHIP - we aim to maintain our membership at around 45 -50 members ie big enough to achieve something worthwhile but small enough to ensure that everyone knows everyone and can create and sustain friendships. Our meetings are friendly and convivial, and we welcome visits from other Rotarians. We encourage those about to retire or recently retired to join us. FUNDS - apart from our own efforts, time and energy, we need funds in order to be able to help most of the good causes we identify. Social events help raise much of our cash, but we attend shows, organise quiz sheets, raffles etc and will rattle cans if it helps. Thus far as a club we've raised around £250,000 and have disbursed it to a wide variety of local and international projects which we select from time to time, as well as to Rotary's own Foundation charity which aims to advance worldwide understanding, goodwill and peace with major projects like the Global Polio Eradication Initiative. Check out here to find out more about us or better still why not come along to a meeting and see what we are getting up to. We'd love to see you so just use the "Contact Form" tab above and we can set it up. If you are concerned that you wont know anyone, why not come along with a few friends. Who knows you may want to join us! Annual 10K run around the lanes between Houston and Bridge of Weir, supported by Arnold Clark, in aid of St Vincent's Hospice. 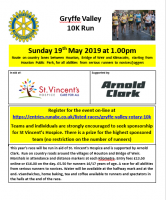 Register for the event on-line at https://entries.runabc.co.uk/listed-races/gryffe-valley-rotary-10k . Charity 10K around the lanes between Houston and Bridge of Weir.